An effective system of medicine that involves inserting very fine needles at certain points (acupoints) along meridian or muscle pathways of the body. Acupuncture can help restore physical, mental and emotional conditions. Acupuncture has been used for over 3000 years and has been gaining popularity in the West due to it's effectiveness in treating a wide range of health concerns. Acupuncture techniques used in treatment of pain and sports injuries. Shauna Robertson has been trained in many different pain relieving techniques. Shauna is able to apply dry needling techniques in conjunction with Traditional Chinese Medicine Acupuncture to promote whole body well being. 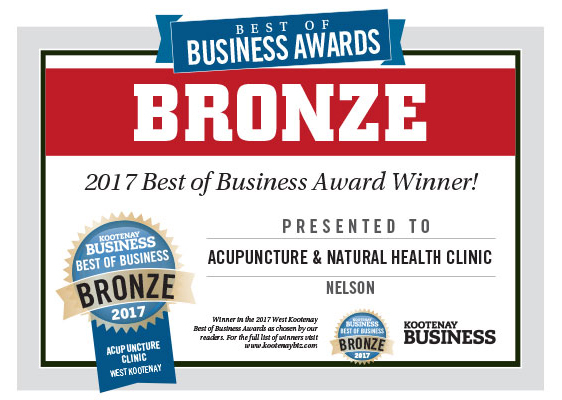 How can Acupuncture help treat my pain? Acupuncture can help relieve pain by releasing natural pain-killing chemicals called endorphins, and by affecting the part of the brain that governs serotonin, a brain chemical involved with mood. The Gokavi Transverse Technique (GTT) is a dry needling acupuncture technique which utilizes high frequency electrical stimulation to aid in the treatment and management of chronic myofascial pain. The technique is done transversely which can be safer than other dry needling techniques. Motor Point Acupuncture is similar to IMS (intramuscular stimulation) and is a form of acupuncture that targets the most excitable area of a short contracted muscle and encourages it to lengthen and stop pain. Cupping is a therapy in which round cups are suctioned onto the skin. Cupping is used for many purposes, including to help with pain, inflammation, blood flow, relaxation and well-being. Cups are used staitionary on the patient or can be moved along muscle bands with oil for a deep tissue massage and to help release myofascial tissues. Chinese herbal medicine is used for the treatment of many health concerns. Herbal formulas can be prescribed in conjunction with acupuncture treatments. However, herbal medicine treatments can be a stand alone treatment if you so desire. Chinese dietary therapy functions to optimize the foods that benefit one's unique constitution. Food as medicine is a powerful way to maintain one's health. Dietary recommendations may be advised during an acupuncture treatment.